While I don’t ride it as a regular, I have on occasion* found myself on the number 2 bus. It offends my sensibilities as a transportation planner. It runs along Franklin Avenue from near Hennepin Avenue S to the University of Minnesota and then runs along 8th St SE to Hennepin Avenue SE. Each of the tails is sensible enough, no one really rides from one end to the other. The problem is the zig-zag in the middle. 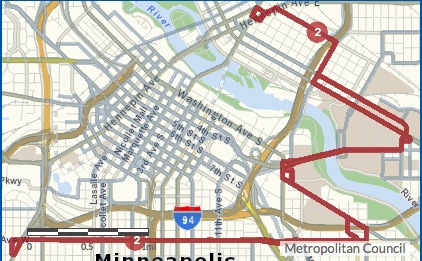 This route has had essentially this structure since before the Green Line (actually before the Blue Line). A transit historian could tell us when it started, as it clearly does not exactly follow any one streetcar line, instead it circumlocutes. So from Franklin it does a ~120 degree turn and goes up Riverside Avenue to pick up the Fairview Riverside campus (M-Health) and Augsburg College. It does another ~120 degree turn when It stops at the West Bank Station, and then runs along Washington Avenue to East Bank, turns at Oak Street and then again at University Avenue/4th Street which is essentially a third 120 degree turn. It crosses the same line of longitude 4 times. It then turns at 10th Avenue. Imagine we removed all this zigging and zagging and zegging. 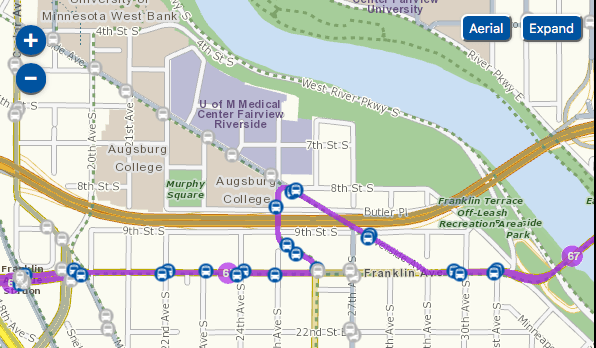 Instead it would turn at 20th Avenue, picking up the other side of Augsburg College, coming within 2 blocks of Fairview University, and then to the West Bank. Anyone traveling to East Bank could transfer to the Green Line or a Campus Connector, It would proceed across the 19th Avenue/10th Avenue Bridge and resume its route. This would shorten the route by a couple of miles in each direction. It would be less convenient for some riders, but more convenient for others. More importantly, because the route was shorter, more runs per day could be achieved on this or other routes. No coverage would be lost. Franklin still has the 67 bus (see below). Riverside still has the 7 bus. Washington Avenue still has the Green Line. University Avenue still has the 6 bus. I am sure there were reasons the bus ran this way. They might have made sense at the time. I am sure there are reasons the bus still runs this way. They make less sense now. Someone will school me in the comments. The number 67 bus, which I take more often, though by no means daily, generally to get to the Franklin LRT, but sometimes in the other direction to get to St. Paul if I don’t want to take the LRT (since the travel time is almost identical) also offends my sensibilities, though to a much lesser amount. It was created along with the Green Line (replacing the number 8 bus), and has been modified since. I have more sympathies for the planners in this case, since it is a low volume route in these parts and needs to hunt for passengers. 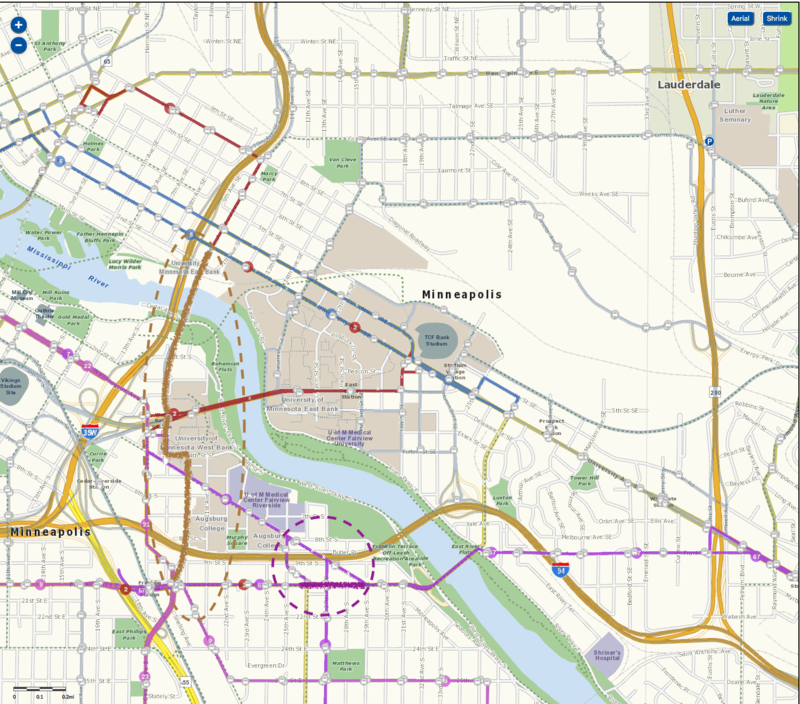 It runs east from downtown St. Paul along Minnehaha and Thomas Avenues, and then University and Franklin Avenues. So far so good. It follows Franklin across the River to Riverside and turns on Riverside, presumably to pick up the very same Fairview Riverside Medical / M-Health complex and Augsburg College as the number 2 bus, and then turns down the curvaceous 26th Avenue S back to Franklin Avenue, terminating at the Franklin Avenue LRT. This detour is not long in the scheme of things, and only crosses the same line of Longitude 3 times. From a far distance it looks like a pimple. But from the point of view of the passenger, I could get off the bus, walk to the next stop on Franklin Avenue, and get back on again. If it went up Riverside to Cedar-Riverside station, I would understand the detour more. Recognizing this would leave only the 2 bus – above serving Franklin, and I just said don’t do that, I would keep it straight on Franklin though. Riverside still has service as well from the 7 bus, so losing the 67 won’t matter much. All of this is to say that straighter routes cost passengers extra walking access time, but save them both in-vehicle time and waiting time (since shorter routes can have higher frequency for the same resources). All of which seems like a good trade-off given our current position. I have previously commented on the spiral routing of the 87 bus. Transit routes with proposed reconfiguration shown for Routes 2 (brown) and 67 (purple). What other bus routes would you reconfigure? Discuss below. * The occasion was carelessly taking the Blue Line instead of the Green Line out of downtown and needing to get back to campus.